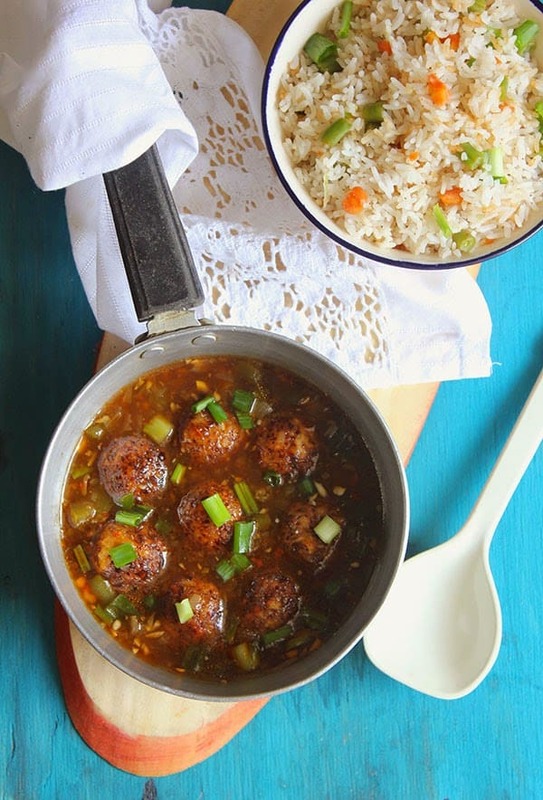 Veg Manchurian with fried rice is one of the congenial Indo-Chinese comfort food. Light, spongy, deep-fried vegetable meatballs plunged in piquant peppery sauce relished with stir-fried rice. The divine combination is always an in-house favorite Friday night meal. 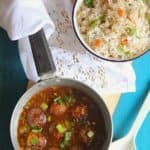 This veg manchurian recipe is tried and tested over the years by me, and confidently I can say it has never failed to yield the most gratifying bowl of manchurian gravy. In the last few decades, the Indo-Chinese food fare has become extremely popular among the food lovers across India. The reason being its simplicity, bursting flavors and a hint of spicy savor, making it quintessential part of Indian food culture. 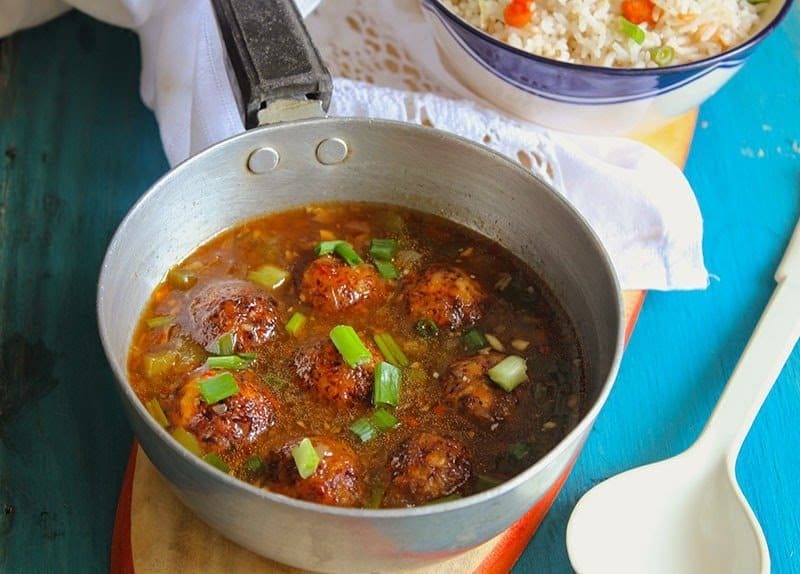 These veg meatballs dipped in a thick and luscious sauce is one of the most popular Indo-Chinese main-course dishes. Often served with a variety of fried rice or noodles veg manchurian make everyone beg for second and third servings. 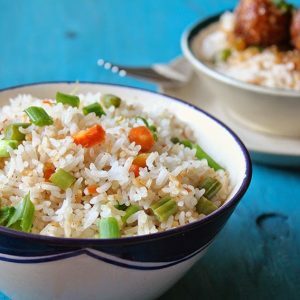 You Might Like To Try -> 10 Best Indo-Chinese Party Recipes. 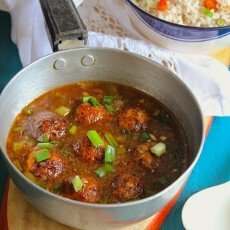 How To Get Perfectly Spongy Manchurian Balls? 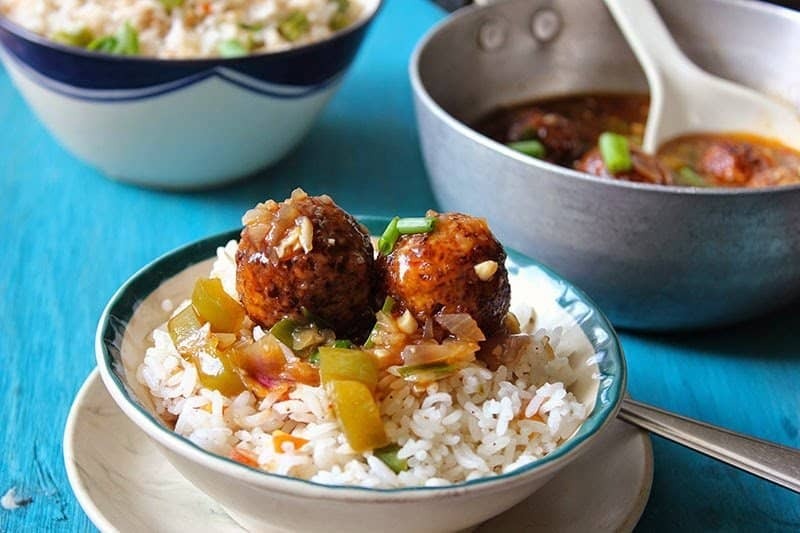 There is no secret trick to get perfect restaurant style vegetable balls for the manchurian gravy. However, these little steps do make a hell lot of difference in the texture of the veg meatballs. Firstly, make sure all your vegetables are dry before grating. The last thing you need in dough mixture is a water-clogged vegetable. Pat dry veggies nicely before processing. Secondly, it is always best to pulse the vegetables in a food processor for the manchurian balls. It makes a lot of difference to the texture of the balls. And make them easy to bind. Often I pulse them all (carrot, cabbage, onion) together in a food processor. Thirdly, if the dough for veg balls seems sticky, add a tablespoon of cornstarch or breadcrumbs. This way manchurian balls are easy to handle and shape. This is one of my most popular Indo-Chinese basic sauce. And I can’t get over it. There is something, so finger licking good about it that makes you crave for more and more. It is a pretty simple gravy that requires only 20 minutes. From vegetable balls, boneless chicken pieces to sliced paneer (cottage cheese) you can add anything in this magical sauce to make a delicious main-course dish. The key flavor in the manchurian gravy comes from the finely chopped ginger and garlic. And I am not talking about roughly chopped ginger/garlic but really fine chopped one. This simple technique transforms the sauce into a true restaurant style one. Last but not the least, do not try to add all the sauces available in your pantry into the veg manchurian gravy. Every sauce plays a particular role to build up the flavor of the manchurian. At times, less is more. So try stick to the three basic sauce we have used in the veg manchurian recipe – soy sauce, red chili sauce, and green chili sauce. Veg Manchurian Gravy is one of the congenial Indo-Chinese comfort food. Learn how to make veg manchurian recipe in this step-by-step video. Mix all the ingredients for vegetable balls except oil in a large bowl. Combine with your fingers to get a soft, pliable dough-like mixture. Keep aside for 10 minutes. Pinch small portion out of the mixture and shape into the small round balls. Once all the balls are ready, keep them in the fridge till oil is heated. Heat oil in a deep frying pan over medium heat to fry the Manchurian balls. Deep fry balls over medium heat in small batches, do not overcrowd the frying pan at one time else balls will not get adequately fried. Once balls are deep brown from outside transfer to a plate lined with paper towels. Turn off the heat and set balls aside until required. To prepare the sauce, heat oil in a saucepan add ginger, garlic and saute for a minute. Next, add the chopped onion and fry over high heat for 2 – 3 minutes. No need to wait for the onion to get brown. Now add chopped capsicum, soya sauce, chili sauce, red chili sauce, salt, black pepper and fry for 5 minutes over medium to high heat. Add water. Stir to combine and let the Manchurian simmer for 5 minutes. Add the cornflour paste to thicken the sauce and again simmer the sauce over medium heat. Once sauce is thickened as per desired consistency add the balls to the sauce and simmer for 5 - 10 minutes. Turn off the heat garnish veg manchurian with chopped spring onion greens. Serve Veg Manchurian with fried rice or chilli garlic noodles. Keeping Manchurian balls in the fridge for 10 – 5 minutes make them firm and there is less chance of balls falling part while deep frying. Before deep-frying the balls you can coat them in corn-flour and water mixture for a crisp exterior. I have not added any green chilies in the gravy but for a spicier gravy go ahead and add green chilies. ★ Did you make this recipe? Don't forget to give it a star rating below! love what you see? Follow @hinagujral on Pinterest! Looking for a foolproof fried rice recipe? We have got one for you. It will perfectly complement the veg manchurian gravy. 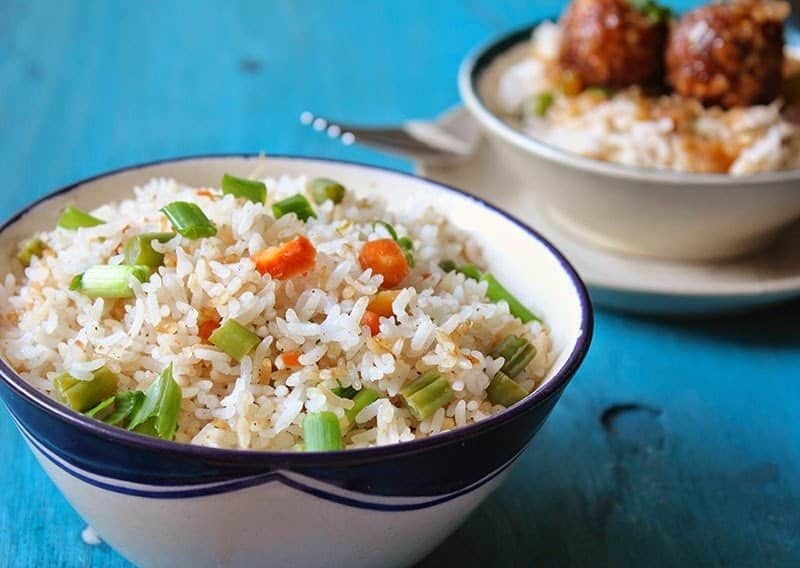 We just can’t think of manchurian gravy without a bowl of fried rice on the side. Together they are a match made in heaven. Learn how to make super delicious vegetable fried rice in a few simple steps. To make fried rice first, clean and rinse rice until the water runs clear of starch. Soak rice in water for at least 30 minutes. Drain soaked rice and transfer rice to a bowl. Boil water in a large pan with salt. When water comes to a gentle boil add drained rice and stir so that rice does not stick to the bottom of the pan. On a low to medium flame cook rice stirring occasionally without rice lid. When the rice becomes al dente (80% cooked) or just until, turn off the heat and drain rice in a colander. Rinse boiled rice with water and let sit in a colander for few minutes. Meanwhile, heat oil in a wok over medium heat. Add chopped white onion, garlic and until over high heat for few minutes. Then add all the finely chopped vegetables and fry on high heat for 5 minutes. Make sure to continuously toss and stir while until so that , are uniformly cooked and do not get burnt and remain crunchy. Add soy sauce, vinegar, salt, and pepper. Stir to combine and add the rice. Stir-fry for a few minutes till everything is evenly combined. Turn off the heat garnish with chopped spring onion greens. 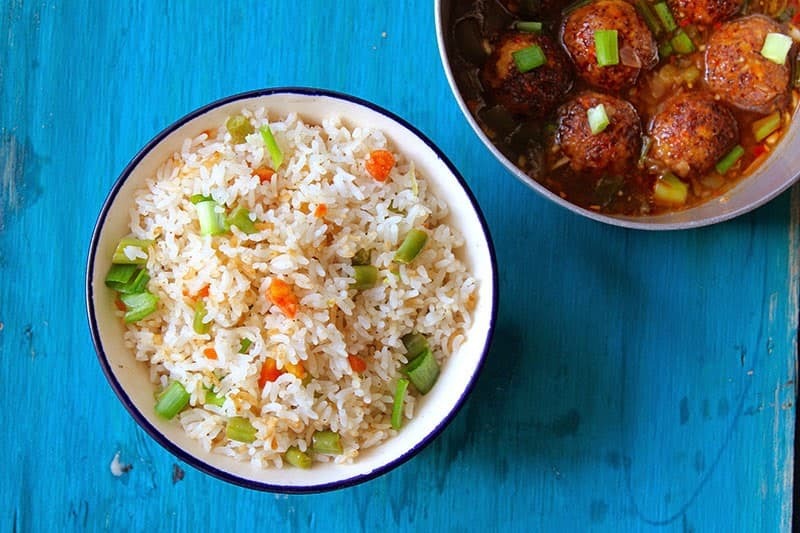 Serve the veg fried rice with veg manchurian. 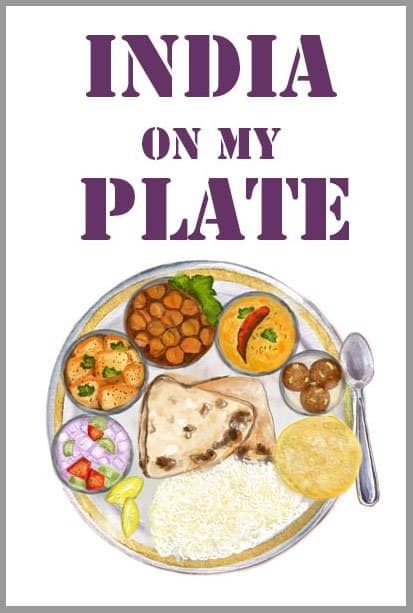 I am a passionate Indian food blogger living in Delhi with my husband and a pooch, named Momo. You can reach me for sponsored collaborations on my email id. I am a freelance content writer, recipe developer, food photographer and stylist. Nice post. I will try it this weekend. I am not too sure if I should use MSG. I like this dish. Thanks for sharing about Vegetable manchurian with fried rice. Hmm… I wonder what the “green chili sauce” is. So many different ones around the world. Is it just pure green Tabasco, or is it a green Mexican style sauce with onion, garlic, green chili and vinegar, or is it some kind of an Indian or East Asian style green chili sauce? Food doesn't always have to be complicated to taste good. Clean, simple and straightforward flavors can do the magic.